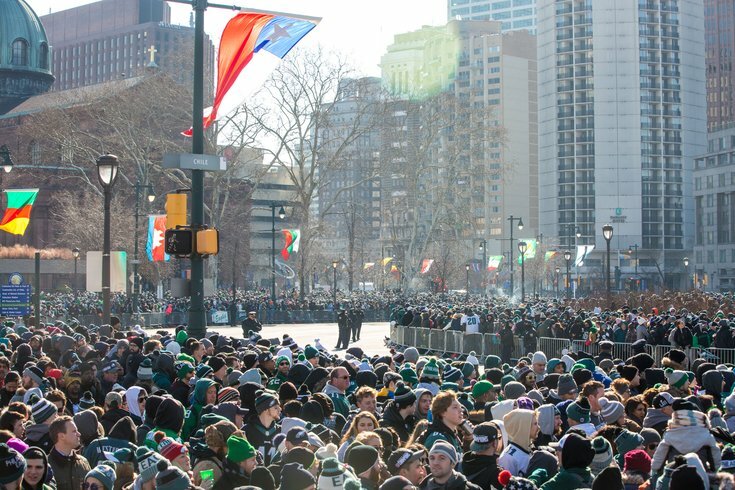 The crowds around Logan Square filled in tight against the barriers hours before the Super Bowl champions would take their victory trip down the Benjamin Franklin Parkway en route to the Philadelphia Museum of Art, Thursday, Feb. 8, 2018. The Philadelphia Eagles will celebrate their Super Bowl win over the New England Patriots on Thursday with a parade that will begin at Lincoln Financial Field and end at the Philadelphia Museum of Art. PhillyVoice will be there, though I am not anticipating any ability to write about it while entrenched among a couple million drunken fans flooding the city. Here's a place to comment, as well as follow along with pictures of the event, via Twitter.